I have created a reference sheet of basic English grammar terms. 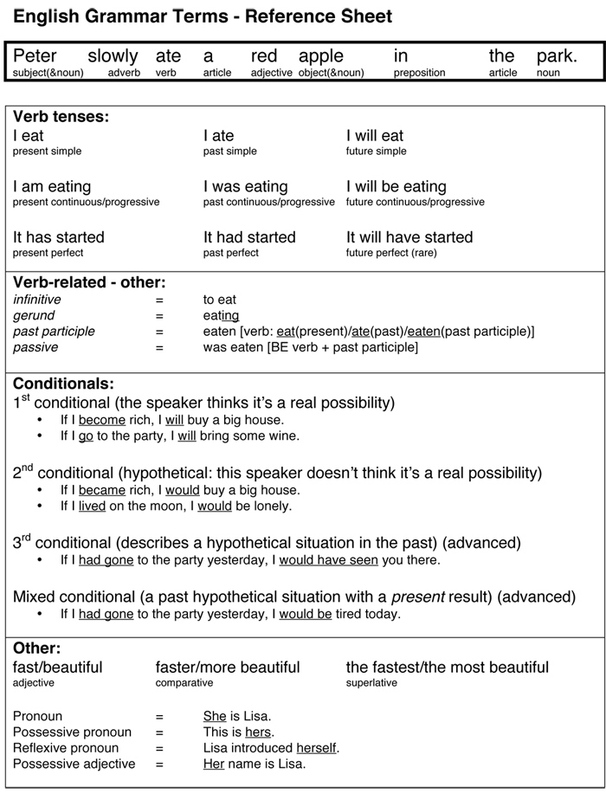 This sheet will be useful for new English teachers who have yet to master English's basic grammatical terminology. Students who are interested in grammar might also find it handy as a reference. If you cannot identify these items, study this reference sheet or print it and bring it to class with you. Not really mistakes, but more a matter of omission… Where is the future continuous/progressive? And what about the subjunctive and imperative modes? Thanks. I added the future continuous (there was space and there’s no reason to leave it out). I left out the subjective/imperative because I want to keep it to one page, and, in my experience, students rarely inquire about them (the zero conditional has been left out for that reason as well). Thanks for the advice! u have given good materials iam thank full for that, but its not enough to study grammer so plz send some more other materilas which helps to learn english..